Our weekly lottery tote is £1 per week. It's all for a good cause and all profits are shared between our chosen charites. and Kidderminster areas looking for new Walking football players and Foot-Golfers. While we're at it, we also invite everyone to join our weekly Lifesavers tote. If you've recently had a knock at the door from from one of our volunteers, they should have been friendly and polite, and if asked, they will have shown you some form of identification. We are passionate about what we do, but we never put pressure on people to join. 1. 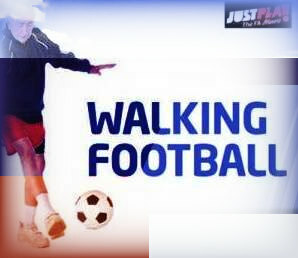 Our initial aim is to find new walking football players (over 50). 2. We then invite everyone to join our weekly lottery tote. £1 per week by bank standing order or a monthly doorstep collection - in selected areas only. 3. We understand that some people may not want to commit themselves to a regular monthly outgoing, so we ask if they would like to have a 'one month only' ticket. (£4 for 4 weekly draws). 4. If it's a "no thanks" to all these questions, it's no problem. We NEVER put pressure on. If you joined our tote, you will have been given a lottery tote number. (A five digit computer draw number beginning with the number 9) Please keep this safe. If you paid for the first month (£4) you will have also been given the current lottery update showing the next four draw dates which you will be entered into. We usually collect £4 straight away and hand out the current monthly update showing the relevant draw dates. Our collector will then see you in 4 weeks for the next £4 payment, and every four weeks thereafter that until you decide to cancel. You can cancel at any time. We sometimes recruit new members the week before our monthly collections take place. In this instance we take NO initial payment. The official collector will then be due to visit you the following week for the first £4 monthly payment and every four weeks thereafter until you decide to cancel. You are welcome to cancel at any time. We collect every 4 weeks - £1 per week x 4 = £4. 13 x 4 = 52 weeks. Once you have joined you do not have to pay for every weekly draw. Each £1 payment made enters your number into one draw date shown on the update. If no payment is made, your number will enter no draws. If £1 is paid your number will enter the first of the four draws. If £2 is paid your number will enter two of the four draws. If £3 is paid your number will enter three of the four draws. If £4 is paid your number will enter all 4 draws. Before holidays and before Christmas we usually do a double (2 month) collection. We attempt to collect £8 rather than the usual £4, to cover 8 draws. If you have supported us for 'one month only', you will enter the next four draw dates, shown on the update leaflet given to you. After these dates your membership expires. You are not added to a collectors list and we will not be calling again next month. If you would like to cancel please inform your collector or call Dave on 01384 341673 and we will terminate your membership immediately with NO hassle. If you are in credit with your payments at the time of cancellation, we will be happy to refund this amount to you if you wish. The first prize each week is only £100, if won, and there are three runner up prizes of just £10 each. We never promise big payouts, or entice people to join for the purposes of winning lots of money. We promote responsible gambling. Each person, over the age of 16, is entitled to a maximum of just one entry per week (£1). The Lifesavers Lottery is a small society lottery, registered with Dudley Metropolitan Borough Council under the Gambling Act 2005. We are also registered under the data protection Act for your security and protection. We never share members' personal details with anyone. The lottery is run by volunteers and is a non profit enterprise. It is NOT a profit making charity, business or commercial venture. All lottery profits are shared between our current chosen good causes. Please see our charity page for more information. How does the tote work? Entry to each draw is £1 per week, (£4 collected every four at your door, or via standing order if you prefer). We collect in advance of the draws and give you a lottery update sheet each month. The leaflet clearly shows the draw dates we are collecting for, plus the winning tote numbers from the previous collection. Our collectors each have identification cards on their person. When you make your payment it is recorded on the collection sheet carried by the collector. All of our collectors are friendly, reliable and long serving friends or volunteers. If you would prefer to pay direct through your bank you are welcome to set up a standing order. There is usually a bank mandate on the back of the update leaflets. Draws take place each Saturday and all winners are notified automatically. There is no need to claim. As previously mentioned, it is impossible to win large sums of money in our lottery. We are a low prize draw. Only members who pay their subscription can win. Only payers are players. If a number drawn is that of a non payer there is no win for that draw or for that member and the number is recorded on the prize list. The first prize each week is £100 and there are three runners' up prizes of £10 each. There are no rollovers. If a winning number belongs to a member who did not pay, or a number which is no longer in use, there is no win for that number. We are a small society lottery, and the amount of money raised from each draw varies from week to week, depending on how many supporters have taken part. If we do not have enough paying members to cover the prize fund and running costs the profits can be negative. Any, and all, profits made by the lottery are shared between our chosen good causes. Lifesavers is a registered lottery, it is not a profit making charity, business or commercial venture. Everyone involved in running the lottery are either volunteers or an expenses paid collectors. The lottery is £1 per week and we have a small number of collectors who collect from members every four weeks in and around the Black Country and Kidderminster areas. It is sadly impossible to run a lottery without incurring some unavoidable costs along the way. These include operational costs such as printing, stationery, computing costs, postage and telephone. We are also obliged to cover the expenses of our collectors if they choose to accept it (fuel etc) and most of them receive a small commission for their efforts. By supporting us via a bank standing order, you would help us to reduce these costs.